QuickBooks Pro Reviews: Overview, Pricing and Features. QuickBooks Pro is a best-in-class accounting software solution for businesses of all sizes across the globe. It is designed to simplify how you organize your finances, provide you with real-time visibility of your cash flow, and keep you apprised of your business’ financial standing. Furthermore, it is known for having robust payroll management features that make it easy to prepare, file, and distribute payroll. 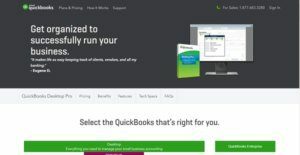 As part of the Intuit QuickBooks product lineup, this software solution offers a set of powerful yet easy-to-use functionalities that both novice and professional users would appreciate. From payroll calculation and tax computing to check distribution and direct deposits, this tool has everything you need to pay your employees correctly and on time. QuickBooks Pro aims to cut down the time accounting teams and business owners spend on payroll preparation while improving paycheck accuracy. According to the vendor, users can get back an average of 10 hours per month and save an estimated $600 annually when they choose to utilize QuickBooks Pro. With QuickBooks Pro, all you will need to do is input your rate, your employees’ regular hours and overtime hours, and commissions, and the software will do the rest. The software even stays up-to-date on tax rates so you don’t have to. QuickBooks Pro also allows you to get instant data updates by syncing your payroll and accounting information. Furthermore, this comes with file sharing options so that you can easily send your data to business partners, consultants, or accountants if need be. Preparing the payroll is a cumbersome task. When done manually, it can take up hours of data input and calculation adjustments. Start factoring in the tax computation, and things can get even messier. Luckily with QuickBooks Pro, you can cut down this time by at least half as the software does most of the work for you. Just import or input your timesheet information and wage rates and the platform will compute the gross pay and net pay for you. This tool also comes with built-in pay distribution options for your convenience. Whether you need to have the paychecks printed or prefer to have the money deposited directly into employee bank accounts, QuickBooks Pro has you covered. As mentioned previously, QuickBooks Pro is capable of calculating taxes automatically. It keeps tabs on the latest federal and state tax rates and applies these to payroll computations to ensure accurate tax filing. The platform even sorts your expenses into their respective deduction categories so you can maximize deductions. In addition, the software comes with a receipt capture tool that can sort out photos or screenshots of receipts and automatically match them to your expenses for easier recordkeeping. Suppose you have prepared paychecks a little late because of problems with securing the data needed for the calculation. After having computed the payroll, you’ll now have to deal with the complications of distributing the money. Whether you opt to print checks and hand them out to employees or deposit the money straight to their accounts, chances are, it would take a considerable amount of time before your employees receive their pay. Using QuickBooks Pro, you can avoid delayed paychecks as the software supports fast and free same-day direct deposit. This way, you can ensure that your team gets their pay on the same day you run your payroll. It will even allow you to automatically generate and print checks for your employees so you don’t have to manually type in their names and the amount they are being paid. Always on-the-go? QuickBooks Pro has a mobile-ready interface that allows you to check your payroll as well as send out payments wherever you may be. Just log in via any browser or use their native mobile application and you’ll have access to all of the platform’s features. Aside from allowing you to electronically pay taxes and pay employees whenever you wish, this mobile application also sends you automatic reminders for tax deadlines as well as paydays. QuickBooks Pro can integrate with other Intuit products so that you can get industry-specific solutions for your operations. It also comes with API capabilities, allowing it to merge with other business systems, plug-ins, and applications. This way, you can extend its functionalities according to the changing needs of your business. Enterprises have diverse needs and requirements and no software platform can be ideal in such a condition. It is pointless to try to find a perfect off-the-shelf software app that meets all your business requirements. The intelligent thing to do would be to adapt the solution for your unique needs, staff member skill levels, budget, and other elements. For these reasons, do not hurry and subscribe to well-publicized leading systems. Though these may be widely used, they may not be the ideal fit for your unique wants. Do your groundwork, look into each short-listed platform in detail, read a few QuickBooks reviews, speak to the maker for explanations, and finally select the product that presents what you want. QuickBooks Pro comes in different pricing plans depending on the types of tools you require. These all come with robust payroll management options as well as user-friendly financial management tools that are ideal for businesses of all sizes. This add-on to the Pro Plus 2019 plan allows users to collaborate with accountants and update accounting at any time without the need for expensive servers or IT maintenance services. We realize that when you make a decision to buy Payroll Software it’s important not only to see how experts evaluate it in their reviews, but also to find out if the real people and companies that buy it are actually satisfied with the product. That’s why we’ve created our behavior-based Customer Satisfaction Algorithm™ that gathers customer reviews, comments and QuickBooks reviews across a wide range of social media sites. The data is then presented in an easy to digest form showing how many people had positive and negative experience with QuickBooks. With that information at hand you should be equipped to make an informed buying decision that you won’t regret. What are QuickBooks pricing details? What integrations are available for QuickBooks? Pros: As a bookkeeper, flexibility is extremely important to me, I need to have an access to my clients’ books from anywhere so I don’t have to go to their place in order to keep the accounting. I like this tool because I can access it from anywhere. Cons: I’d like to see a feature to import the checks. It is time-consuming for clients who use one system to track the information and to use QB for accounting and payroll. Pros: The system sync well with all my financial accounts, and all my transactions are in one system automatically. There is no need for manual work. I can locate my business finances from one location and access it from everywhere. Cons: If you don’t have an experience with accounting then it would be little difficult to use this tool. It would be helpful if they could include the tutorial, I’m not satisfied even from the customer service either because when I called them they made the problem even worse. If you need more information about QuickBooks or you simply have a question let us know what you need and we’ll forward your request directly to the vendor.